This fall, Robots in Architecture teamed up with Absolut Vodka (Pernod Ricard Austria) to create a unique robot installation for their new “Absolut Originality” limited edition vodka series. Our goal was to create unique T-shirts based on portraits of their owners-to-be via robotic spraypainting. We take a picture, transfer it via the camera’s WiFi connection to a laptop running Rhinoceros/Grasshopper and process it using a specially developed vectorizing component. This data is then passed on to KUKA|prc, which immediately previews the robot’s kinematic movements and outputs a KRL file. The spraypainting-strategy was developed in cooperation with the Viennese graffiti artist Skirl, under consideration of the robot’s kinematics to create a solution that is both aesthetically and technically optimized. Hardware-wise, a customized endeffector was 3D-printed via Selective Laser Sintering (SLS) and equipped with two slightly modified Colani sprayguns. On the robot side, we used a black KUKA Agilus robot whose high-speed internal air valves controlled the flow of air to the sprayguns. Over the course of a month, the robot installation was exhibited at five locations throughout Austria: At Kare, Passage Club, Blickfang Design Fair, Elevate Festival, and Rauch Club. Producing more than 500 T-shirts (themselves limited and numbered, just like the vodka), we had a great time and the privilege of working with an excellent team around us. In other news, the Rob|Arch 2014 paper deadline is quickly approaching, You can submit your scientific papers until December 1st. As the Springer time-schedule is very tight, we do not expect to be possible to grant an extension of that period. 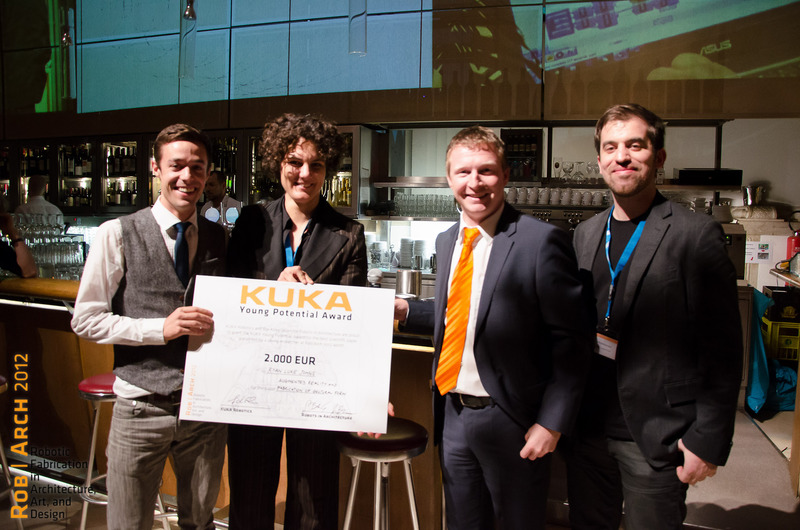 To support young researchers in the field of robots in architecture, art, and design, the KUKA Young Potential Award (worth 2500 USD) will be granted again in 2014 to the best scientific paper at Rob|Arch by a researcher of 35 years or less. Last Rob|Arch’s winner was Ryan Luke Johns of Greyshed for his paper Augmented Reality and the Fabrication of Gestural Form.